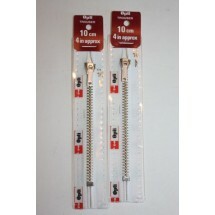 Metal Zips 10" (25cm)	There are 8 products. 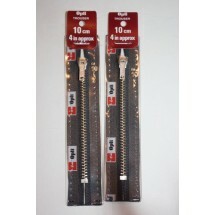 1 * Metal Zips 10" (25cm) - Black. A strong metal zip with silver teeth suitable for trousers and heavier fabrics. 1 * Metal Zips 10" (25cm) - Navy. A strong metal zip with silver teeth suitable for trousers and heavier fabrics. 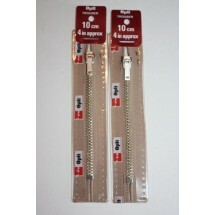 1 * Metal Zips 10" (25cm) - Beige. A strong metal zip with silver teeth suitable for trousers and heavier fabrics. 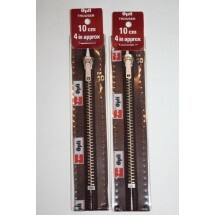 1 * Metal Zips 10" (25cm) - Brown. A strong metal zip with silver teeth suitable for trousers and heavier fabrics. 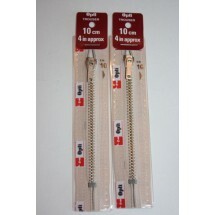 1 * Metal Zips 10" (25cm) - Cream. A strong metal zip with silver teeth suitable for trousers and heavier fabrics. 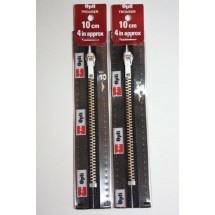 1 * Metal Zips 10" (25cm) - Dark Grey. A strong metal zip with silver teeth suitable for trousers and heavier fabrics. 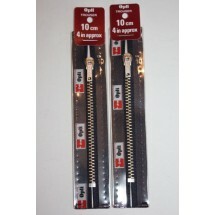 1 * Metal Zips 10" (25cm) - Mid Grey. A strong metal zip with silver teeth suitable for trousers and heavier fabrics. 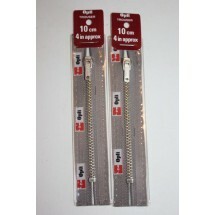 1 * Metal Zips 10" (25cm) - White. A strong metal zip with silver teeth suitable for trousers and heavier fabrics.